Start with certified, disease-free “seed” potatoes, acquired from either catalog or farm-store. If you buy from a farm-store, try to select tubers which have already sprouted. Pre-sprouted potatoes can be harvested as much as two to three weeks earlier than their non-sprouted kin. 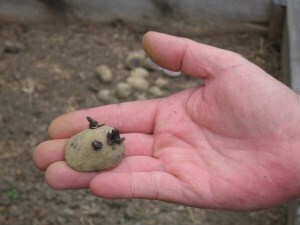 Only the smallest of seed potatoes should be planted whole. Cut large tubers into pieces. I cut mine so that each segment has two or three “eyes” – the little bumps from which sprouts eventually emerge, as illustrated above. Next, either set the cut pieces out in the sun, or place them on a table or counter in a warm (70-degree), moderately lit room for two days. This extra step permits the cuts to callous, and consequently mitigates rot. 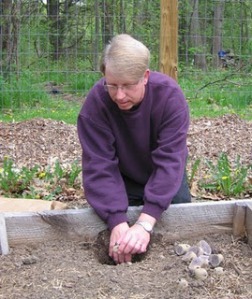 Me, planting ‘All Blue’ potatoes in a raised bed. Planting. In loose, fertile soil, plant each potato segment, cut-side-down, in a six-inch-deep hole. Space each segment (or small, whole tuber) 12 inches apart on all sides. Cover with soil, and water well. Then apply a two-inch thickness of straw mulch to conserve moisture and smother weeds. Hilling. To increase your yield, “hill” the potatoes. When vines reach six inches in height, cover all but their top two inches with soil or straw mulch. This will cause the seed-potato to make additional underground stems, or “stolons.” It is along these stolons that potatoes are produced.You can continue this hilling routine as long as you like (or until you run of out room, if you are growing potatoes in a raised bed). Watering. Throughout the growing period, provide the growing vines with an inch of water each week. Decrease water at harvest time, as the vines turn yellow and begin to die back. Darkness, Please. Potato tubers, like vampires, need to live in total darkness. In fact, they will turn green if exposed to light. And a green potato can cause sickness if consumed. Therefore it is essential to keep the tubers completely covered with soil or mulch. When to Harvest. Two weeks after the vines have flowered (and how lovely those flowers are! 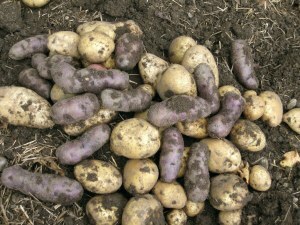 ), you can, if you wish, stick your hand into the soil or mulch to retrieve a few baby potatoes. I usually fight such temptation, however, and wait until the vines have died back, a sure sign the tubers have matured. Storage. Since my potatoes are grown for storage, I leave them in the ground until cool weather arrives. Why? Because potatoes will only store well if they are placed somewhere cold, but not freezing. The closet in my mudroom doesn’t cool off until the outside temperatures plunges to 45° at night. So harvest time for me is usually a sunny day in late October. After digging the tubers, I let them sit on top of raised beds for a few hours to dry, as illustrated. This brief drying-period toughens their skin, and prepares them for storage. Then I gently brush off any loose soil from the tubers, and place them in double thicknesses of paper bags. Varieties. Look through any gardening catalog and you will find an infinite number of potato varieties. My own personal favorites are good storage-types: ‘Red Pontiac,’ white ‘Kennebec,’ white ‘Superior,’ creamy ‘Yukon Gold,’ and ‘All Blue.’ These delicious four produce considerable yields in the Northeast. I love potatoes so much as I am a “meat and potatoes” kind of guy. How wonderful that you can grow them right there in those raised beds! If the economy gets much worse I may have to learn to grow my own too. …and now you know how! If you post a comment, and blogger says “Your comment could not be processed,” click “Post Comment” a second time. I have to do this frequently (for some reason). Thank You Kevin!!! Once again, very informative!!! My Hubby just built my raised beds yesterday…. I can't wait to get started! Erin – congrats to you. Raised beds are a gardener's best friend! Right on time, Kevin. I just bought seed potatoes: Yukon Gold, Blue, and some kind of fingerling (can't remember the name). Kevin, great tip regarding pre-sprouting. The middle of May is when I plant potatoes here. Not sure what kind I'll grow, other than Yukon Gold. Can you recommend a good early variety? Yolanda – two earlies that I'm familiar with are 'Red Pontiac' and 'Red Norland.' Both mature in 60-80 days. 'Yukon Gold,' of course, is also early. Do you have any tips for growing potatoes in a wire bin? I'd like to try cultivating them this way, using straw instead of soil. Thanks! Welcome, Eden. It's very easy to grow potatoes in a wire bin. First, place 6 inches of soil in the bottom of the bin. Then plant the potatoes. Next, hill (and hill) with straw as outlined above. Finally, when vines have died back, simply unlatch the bin and retrieve your (bountiful) harvest! Eden – Good dimensions for a wire-mesh potato-growing bin: 3 feet in diameter, 4 feet high. To make such a bin, you will need a 9-feet by 4-feet length of wire-mesh fencing. Kevin, what a great help you've been. I'm glad I found your site! This will be my first year growing potatoes. I added 2 raised beds to my garden specifically for potatoes and onions and garlic. Thank you for the planting and harvesting instruction of the potatoes! I am looking forward to my first harvest. I think that I will not resist temptation and will definitely gather a few baby potatoes. This is my first year for planting potatoes, too. Thanks for all the great advice. I would never have thought to cut the large tubers up. Since most of us in my family have bad backs and/or knees, I was thinking of doing hip-high raised beds, and just filling them with soil I purchase from the gardening store. When I build them, do I have to rip up the grass and stuff on which I’ll build them, or would they be tall enough that I can just cover the grass and build the beds right over them? I was thinking of pine planks, with a plastic liner, to keep the wood from rotting. If I punch holes in the bottom, would there be sufficient drainage? Should I use something other than plastic on the bottom, so that there would be drainage? Wouldn’t that allow weeds to grow up from roots under the whole thing? I was also thinking of having these raised beds, designed with a door in the front, for easy access, set up so I can plant potatoes down low, and then fill the beds as I hill the potatoes, and then rotate them, from year to year, so they’d all have to be set up that way (or at least 4 of them). Have you ever tried anything like this (with the door), and if so, what was your opinion? Did it work out well? It is so exciting planning a garden for the first time! Michelle – thanks for transferring your comment to this post. You do not have to dig up the grass before you lay down your raised bed. To kill off the grass (or weeds), place newspaper (a thick layer) or corrugated cardboard at the bottom of bed. Definitely do not place plastic there. A plastic liner stapled to inside walls of the bed is fine, and probably a good idea. As for the door idea, this sounds good in theory but probably not in practice. Why? Because, as you rotate your potato-planting from bed to bed, eventually all of your beds will get filled with soil. And removing that soil from year to year will be difficult — even with a door at one end. Good luck with your planning — its always good to seek as much advice as possible before arranging a garden. I know this from my own countless errors! My garden produces only small potatoes. What’s wrong? 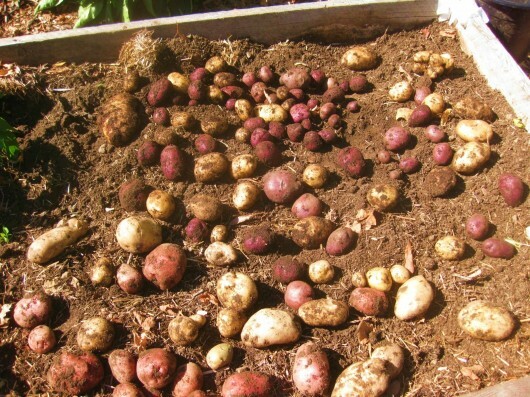 Abe – In my experience, too-close planting is the result of small potatoes. Try to space your seed potatoes 12-inches apart on all sides. I have two concrete slab wood walled patios attached to a condo; each has a gate and a sliding patio door on one wall. Concrete space for container gardening is 8′ lgth x 4’wd. How would I grow yams/sweet potatoes? Kevin, Am really enjoying your articles. My problem is storage after harvest. I have a crawl space under my house and two sheds outside (one with a concrete foundation and the other with plastic over dirt). Where can I store the potatoes so they don’t rot or get bugs, etc.? I would also like more information on storage of potatoes. I’ve been having good harvests growing them in felt-like grow bags, but losing them later in storage. I live in a mobile home in a park, so #1, since the ground isn’t mine, I’m limited as to what I can do (if I had my own ground, I’d put in a root cellar). Secondly, I’ve tried keeping them in a dark closet inside, but they sprout long roots and get spongy. This winter I put them in my shed which has a wood floor a few inches above a concrete pad, thinking the heat given off from my upright freezer in there would be enough to keep them from freezing. It wasn’t, and I lost over 30 pounds of sweet potatoes because they froze and then rotted. Some of the white potatoes did the same, but again I had the sprouting long roots and getting spongy issue. I do have some crawl space under my home, but I haven’t tried that because I figured I’d get too much insect damage (chipmunks and mice are able to get in as well). What about growing potatoes in a container? I live in an apartment/3 floor and don’t have much space on my balcony. The past two years I have grown tomatoes and that has worked out pretty well. This year I would like to try beans and maybe potatoes. Any thoughts would be great.. Some how I can’t seem to find the part on properly storing your harvest of potatoes. We have trouble with potatoes going bad over the winter. we live in the San Francisco Bay area. What should we do and not do to achieve long storage of our harvested potatoes. I read that you keep the potatoes in the dark when storing and put an apple with them. Its supposed to help them store longer. Years ago someone wrote about a method of growing them in used tires. Place a tire on the ground, fill with soil and plant the seed. As the potato plant grows add another tire and add soil. You keep layering with the tires until time to harvest. To harvest just knock over the tires. No bending or digging. Never tried it but sounds interesting. We have a 1st grade garden at school. So this year I had turnips and rutabagas rooting in my refrigerator crisper because I forgot them, so into the dirt they went. Viola beautiful. Then I thought I wonder if I could root a potato. So I rooted a small white potato (maybe Yukon gold), planted it in January and Friday harvested 3 little potatoes. I guess I can grow potatoes in Phoenix. The 1st grade will be so excited. this was the most informative and accurate description of planting potatoes that i have read. I was raised on a potato farm in northern Maine and this is exactly how it was done back then. All the seed potato was cut into quarters by hand, set out overnite and planted the next day. At harvest time potatoes were dug up and laid to rest in the sun for a bit and then hand picked with baskets and then put into a dark root cellar for the winter. What was left over in the spring was used as seed for the next crop. Great write up and pictures. 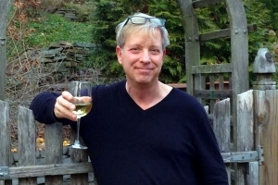 Kevin – as a novice gardener I really am enjoying your site. Could I grow potatos in a large plastic bin? I would drill holes for drainage. What are your thoughts on this? Thank you. Apryl – Growing potatoes in stacked tires is a good idea — in theory, at least. I’d be concerned about toxic chemicals leaching into the soil, especially as the weather warms and the tires heat up. But maybe I am being overly cautious. Paula – What a great way to introduce kids to the “magic” of horticulture! Melissa – Glad you liked this article, and thought to tell me so. Marcia – Doug Hall, the Senior Editor for Organic Gardening Magazine, once tested potato-growing methods in 7 different ways: in excavated trenches; on top of the soil with a mulch covering; in a raised bed; in a black plastic bag; in a canvas “grow-bag”; in a wire-mesh bin, and in a wooden box. As I recall, only the potatoes grown in excavated rows and in a raised bed produced good-sized potatoes. True, potatoes were produced with the container-grown methods. But those potatoes were small. Hi, I’m just about to plant potatoes after the last winter frost (downunder). A couple of weeks ago a Tasmanian potato farmer hinted that his success was partly due to planting the whole seed potato and taking off all but one sprouted eye! Shall use his tips and yours. Hydroponic system – Nice to meet you. So glad you enjoy this site. 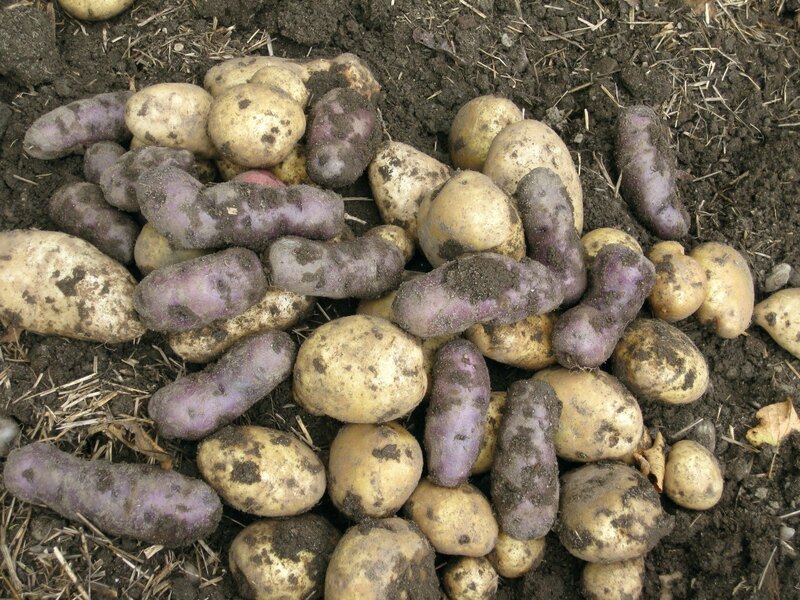 Tried Yukon Gold and Red potatos last year here on the Eastern Shore of VA. Plants were too close together so will be having a go at bin planting this year. Lots of ‘tater farms in the area so will go with reds and those blue ‘taters I’ve seen. Strawberries are on the list this year and cherry tomatos. Cucumbers, beans and have room for one more but not sure what. Will let ya know how things go. Got Hyacinths blooming, Daffys, tulip leaves and the trees are just budding. Spring has just about sprung and better weather can’t be far away. Thanks for your site, I really enjoy it. 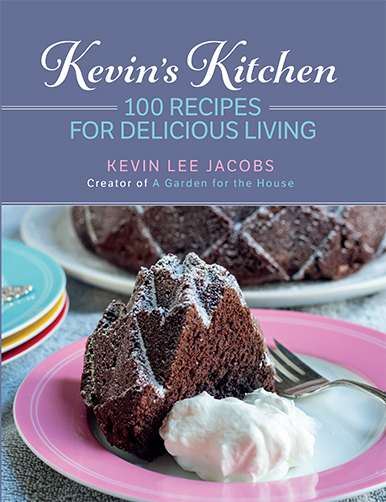 Kevin forgive me if I missed something in this piece but when do you plant potatoes? I have a home in Arizona SW zone 8b high desert? Loved this piece. Again, always informative and well done. I learn a lot from your letters. Perhaps the wire bin listed by another reader is an option for me. I have a tiny yard and voracious squirrels. The neighbors (bad neighbors!) feed the squirrels, so they breed prolifically and treat every yard without a very large dog as a free buffet. Where might I find such a magical bin? I want purple potatoes! A member of our garden club uses retired freezers for raised beds.adds drainage holes. The insulation provides better growing conditions as well. I planted potatoes last year ( my first time ever !) they were yellow potatoes ( sorry forgot the variety – got them from walmart garden center ). Well I got very healthy plants and then the plant started to dry out but at the same time new branches, green and healthy, were sprouting too. So I waited till the new branches dried out and then harvested huge potatoes. But when I cooked them, they took forever to cook . I tried boiling some and it took over an hour and even then it was not fully cooked. What do you think happened. I am scared to plant these again. Any advice is greatly appreciated. Thank you for sharing your knowledge with us. Hi Renuka – Well, I certainly wouldn’t plant the same variety of potato again! Instead of purchasing your “seed” potatoes from a generic source (like WalMart, Home Depot, etc. ), maybe obtain them from a reliable online dealer (I like johnnyseeds.com) or from your local farm stand or farmers market. I regularly plant ‘Yukon Gold,’ ‘Superior’ and ‘Red Norland.’ All these produce well in my Hudson Valley, NY location. And they cook to perfection in minutes — not hours! This is the most helpful step-by-step post I have found on potatoes. I’ve been reading your blog for a few months now and clearly haven’t found all the “golden nuggets” yet – so glad you linked back to this! Thank you! Oh, also just wondering if this would be the same process for sweet potatoes/yams? Do you have any experience with those? Hi Meg – Glad you found this article useful. Unfortunately I’m unable to advise you on the harvest and storage of sweet potatoes or yams, simply because I’ve never grown them. To my utter amazement. Before we moved, we successfully grew red Norlands. Now, the plants wither and disappear. Husb says this 110 year old ground is worn out and needs tilled, 13-13-13 fertilizer added so we did. We mulch with straw. Planting again next week although I’m not encouraged. Advice? Thank you Kevin this is exactly what I was looking for!!!! Hi Kevin! I followed the directions provided in Fine Gardening magazine last winter for growing potatoes in wire mesh. My husband made me 3 wire cylinders 3 ft across and 4 feet tall. Following the magazine directions, I layered straw then compost ( planting the potatoes with the eyes facing outward in the compost layer) and repeating for layers…super easy once I got going. We harvested one container inadvertently when we tried to move it and had so many potatoes that I took half to the food bank. Looking forward to seeing the bounty in the other two bins. Anyway, it is my new favorite way to grow potatoes. I lived in the Pacific northwest and planted on St Patrick’ s Day. Thanks for the tips on storage! I live in Phoenix, AZ. My problem is my potatoes rot in my pantry, which is just a small closet. Where should I keep them living in the “dry heat”? kevin i.m wanting to know when its a good time to plant my yokan potaoes, for winter.and when is a good time to dig then up?